Aashayein, the one day exclusive free event for dialysis patients is back. 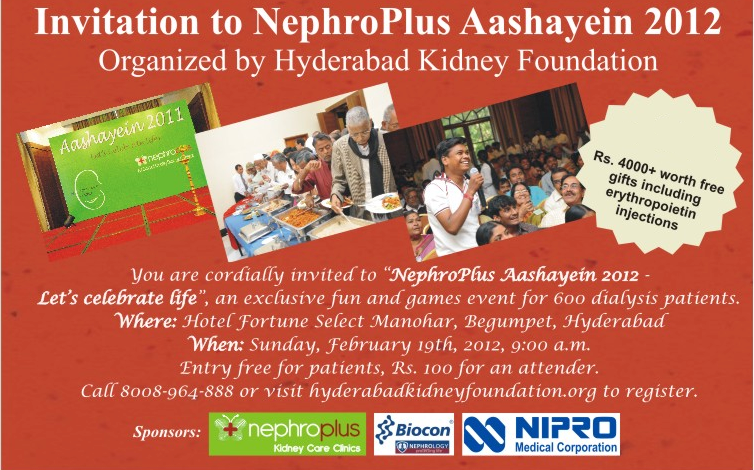 After creating quite a sensation last year, the NephroPlus sponsored Hyderabad Kidney Foundation is organizing the second edition of the event this year on Sunday, 19th February, 2012 at 9:00 a.m. The event is being held at the same venue as last year, Hotel Fortune Select Manohar, Begumpet, Hyderabad. The event will have educational talks by nephrologists, urologists, dietitians and patients. There will also be a whole lot of fun and games exclusively for dialysis patients. There will be an elaborate lunch prepared as per the dialysis patient diet. There will also be a whole lot of goodies for dialysis patients which will include erythropoietin injections. NephroPlus is the chief sponsor and the title sponsor of the event. Biocon Nephrology and Nipro are the other main sponsors. Seats are limited and last year, the registrations had to be closed a few days prior to the event. So, I would suggest that you register early enough. To register, please visit the Hyderabad Kidney Foundation website or call 8008-964-888.